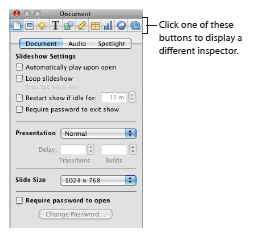 Toolbar – A toolbar located at the top of the window gives you fast access to the tools you need to create your slides. 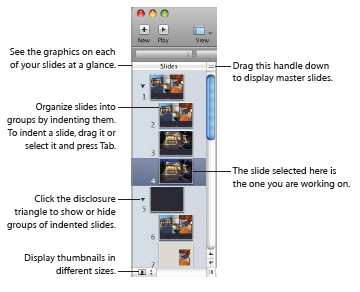 Slide navigator – The slide navigator provides a visual overview of your slideshow. You can view a thumbnail of each slide or a text outline. Presenter notes field – You can write notes about individual slides in the presenter notes field. Presenter notes lets you refer to them during a presentation, nut audience won’t see them. Format Bar – The format bar gives you fast access to formatting tools for customizing text, tables, charts, and more. The controls that appear on the format bar depend on the item you have selected on the slide canvas. To customize the toolbar, Choose View > Customize Toolbar, or Control-click the toolbar and choose Customize Toolbar. To remove an item from the toolbar, drag it out of the toolbar. To restore the default set of toolbar buttons, drag the default set to the toolbar. To make the toolbar icons larger, deselect Use Small Size. To display only icons or only text, choose an option from the Show pop-up menu. To rearrange items in the toolbar, drag them. To remove an item, press the Command key while you drag the item out of the toolbar, or press the Control key as you click the item and then choose Remove Item from the shortcut menu. To move an item, press the Command key while you drag the item. To see a description of what a toolbar button does, hold the pointer over it. The slide navigator at the left side of the window provides a visual overview of your slideshow. 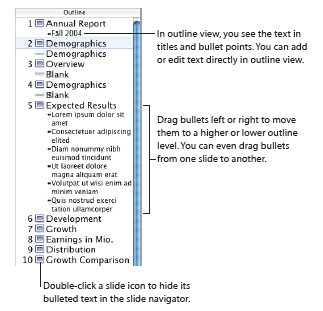 To show the slide navigator, choose View > Navigator or View > Outline. To hide the slide navigator, choose View > Slide Only. Keynote offers several ways to view, manage, and organize the slides in a Keynote document: navigator view, outline view, and light table view. You can also view only the slide canvas. To change from one view to the other – Click View in the toolbar and choose an option (or choose View > Navigator, Outline, Light Table, or Slide Only). To show navigator view, click View in the toolbar and choose Navigator, or choose View > Navigator. To rearrange or indent slides, drag them. To show or hide groups of slides (indented slides and their “parent” slide), click the disclosure triangles. To enlarge or shrink the thumbnail images, click the button in the lower-left corner and choose a size. To create a duplicate slide, select the slide and choose Edit > Duplicate. The duplicates are inserted following the selected slides. To copy and paste one or more adjacent slides, select them, choose Edit > Copy, select the slide after which you want to paste the copied slides, and choose Edit > Paste. To show master slides (useful if you create your own master slides or themes), drag the handle at the top right of the slide navigator, or click View in the toolbar and choose Show Master Slides. Outline view is most useful for visualizing the flow of text-rich presentations. It displays the title and bullet-point text of each slide in your slideshow. You can easily order and reorder your bullet points as you organize your presentation. You can add bullet points to existing text directly in the slide navigator. You can also drag bullets from one slide to another, or drag them to a higher or lower level within the same slide. To print the outline view, choose File > Print. 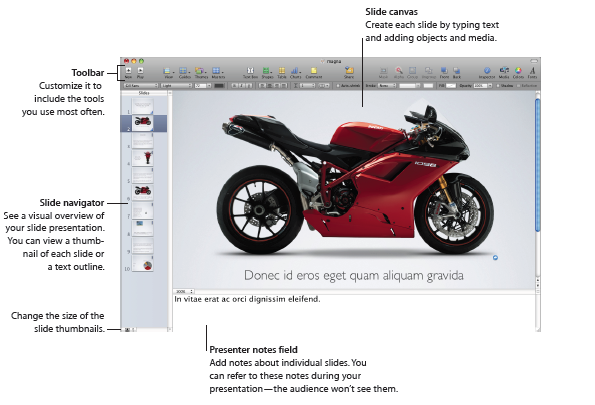 In the Print dialog, choose Keynote from the Copies & Pages pop-up menu, and then select Outline. Light table view can be used to see all the slides as thumbnails. You can easily reorder slides by dragging. To show light table view, click View in the toolbar and choose Light Table (or choose View > Light Table). To enlarge or shrink the thumbnail images, click the button in the lower left of the window and choose a size. To edit a slide or return to your previous view (navigator or outline), double-click a slide. In light table view, you can add, delete, duplicate, skip, and reorder slides (similar to navigator and outline views). Choose View > Enter Full Screen or click the Full Screen button in the top-right corner of the Keynote window. As you work on your document, jumping to a particular slide is easy. In navigator or outline view, click a thumbnail in the slide navigator to jump to any slide. Choose Slide > Go To and choose one of the options (Next Slide, Previous Slide, First Slide, or Last Slide). Format bar can be used to quickly change the appearance of text, tables, charts, and other elements in your slideshow. The controls in the format bar depend on which object is selected. To see a description of what a format bar button or control does, rest the pointer over it until a help tag appears. To show and hide the Format Bar: Choose View > Show Format Bar or View > Hide Format Bar. Here’s what the format bar looks like when a shape is selected. To open a single Inspector window, when none is open, click the Inspector button in the toolbar. To open more than one Inspector window, choose View > New Inspector. After the Inspector window is open, click one of the buttons at the top to display a different inspector. Clicking the second button from the left, for example, displays the Slide inspector. Rest your pointer over buttons and other controls in the inspectors to see a description of what they do. The Media Browser provides access to all the media files in your iPhoto library, your iTunes library, your Aperture library, and your Movies folder. You can drag an item from the Media Browser to a slide or to an image well in an inspector. To open the Media Browser: Click Media in the toolbar, or choose View > Show Media Browser. To add a folder containing audio files, click Audio in the Media Browser, and then drag the folder you want from the Finder to the Media Browser. 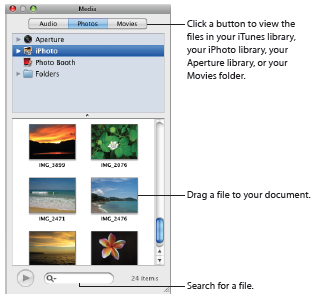 To add a folder containing photos, click Photos in the Media Browser, and then drag the folder you want from the Finder to the Media Browser. To add a folder containing movies, click Movies in the Media Browser, and then drag the folder you want from the Finder to the Media Browser. You use the Colors window to select color for objects. 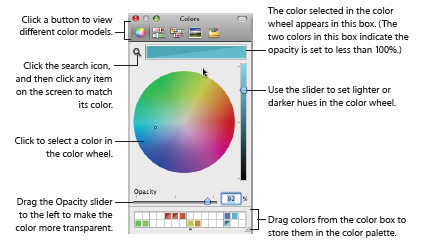 You can use the color wheel in the Colors window to select colors. The color you select appears in the box at the top of the Colors window. You can save that color for future use by placing it in the color palette. To remove a color from the palette, drag a blank square to the color you want to remove. Fonts window lets you select fonts, font sizes, and other font formatting features, including text shadows and strikethrough. You can also use the Fonts window to organize your favorite and commonly used fonts so that they are easy to find when you need them. Click the Add Collection (+) button to create a new collection. Select some text and format it with the font family, typeface, and size that you want. Drag its name from the Family list to the collection where you want to file it. If you change fonts often, leave the Fonts window open. 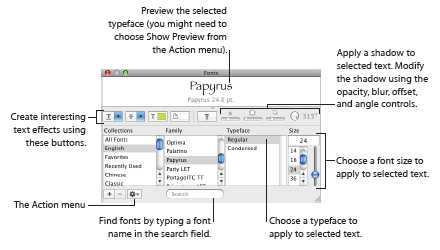 Resize the Fonts window using the control on the bottom-right corner of the window, so that so that only the font families and typefaces in your selected font collection are visible. When you import a document into Keynote, or export a Keynote document to another format, some elements might not transfer identically. The Warnings window lists any problems encountered. Whenever a problems is encountered, you’ll see a message enabling you to review the warnings. If you choose not to review them, you can see the Warnings window at any time by choosing View > Show Document Warnings. If you see a warning about a missing font, you can select the warning and click Replace Font to choose a replacement font. You can copy warning messages and paste them into a document for reference later; these messages could be useful for diagnosing problems. Hope you like this Keynote tutorial.Like our Facebook Page and don’t forget to add Apurva Tripathi and Prashant Tyagi on Google+ for such tips and other amazing stuff.